Avid readers of the CAP blog might remember our excitement last year when we discovered a piece of yellow-green vaseline glass in the Gunson assemblage. The glass glowed bright green under black light, indicating it contained uranium. 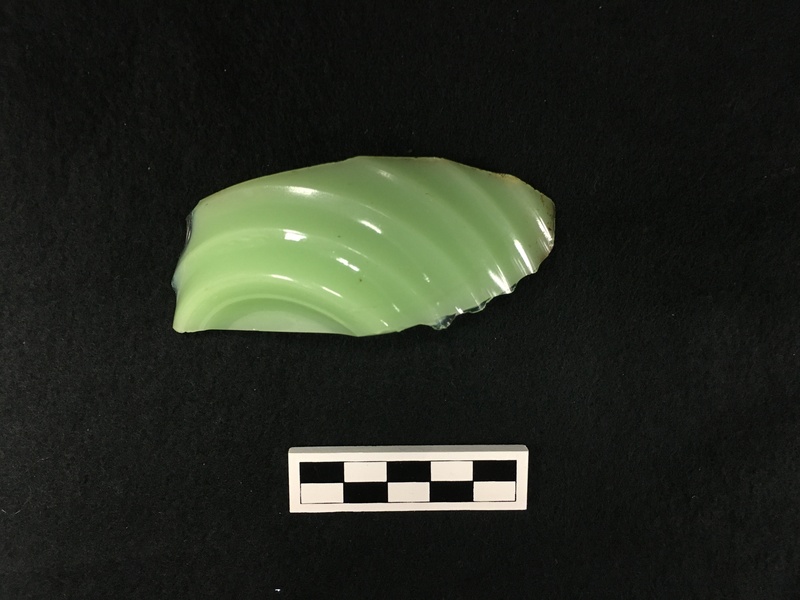 This week as we continued to sort through the large quantity of glass from the Brody/Emmons Complex assemblage we came across another piece of glowing glass: part of a horizontally ribbed bowl in a striking jade green color. If you’re a collector or a frequenter of antique stores, you’ve probably already guessed the identity of our second piece of glowing glass: jadeite, another type of uranium glass. Before we continue we should probably address the radioactive elephant in the room: why would people put uranium in stuff we eat and drink from? It might sound strange, but uranium was once a common colorant added to glass and ceramic glazes. Uranium glass was particularly popular in the early 20th century, when large quantities of uranium salts were being produced as byproducts of the radium extraction industry (1). The addition of yellow uranium oxide during the initial glass melting process produces colors ranging from yellow to green, though other hues including pink, blue, and white can be obtained by adding other colorants to the mix (2). Glass colored with uranium salts is easily identified because uranium fluoresces bright green under ultraviolet light (3). Luckily, since these items emit only negligibly tiny amounts of radiation, they are safe to handle, eat and drink from (3). Uranium fell out of use after World War II when it became critical to the war effort (think: the Manhattan Project). From 1942 to 1958 civilian use of uranium was heavily regulated, so glassmakers had to find different ways of achieving similar colors (3). The fact that the fragment from the Brody/Emmons Amphitheater assemblage glows green under black light tells us it contains uranium and therefore that it dates prior to 1943. So what’s the deal with jadeite? Or is it Jadite? Jade-ite? All of these terms refer to the opaque, milky green colored glass originally manufactured by one of three glass companies: McKee, Jeanette, and Anchor Hocking (4). McKee Glass Company of Jeannette, Pennsylvania was the first to make kitchen and dinnerware from this material. Beginning in 1930, they produced opaque green dinnerware they marketed as “Skokie” green (5). Jeannette Glass Company, also located in Jeannette, began manufacturing a similar glass product starting in the mid-1930s (4). Jeanette coined the term “Jadite” in reference to the product’s resemblance to the semi-precious stone. The Fire-King division of Anchor Hocking was the last of the three companies to start making this product, which they called “Jade-ite” (4). After World War II, Fire-King began selling jadeite kitchen and dinnerware similar to those made by Jeannette and McKee (6). They also made a highly successful line of restaurant ware that was thicker, heavier, and sturdier than the products intended for home use (6). Fire-King Jade-ite was manufactured and sold between 1945 and 1975 and is highly collectable today (6). The discerning reader will notice that these later dates of production mean that Fire-King Jade-ite could not have contained uranium. This tells us that our jadeite was probably made either by McKee or Jeannette, which both used uranium in their production during the 1930s and early 1940s (3). 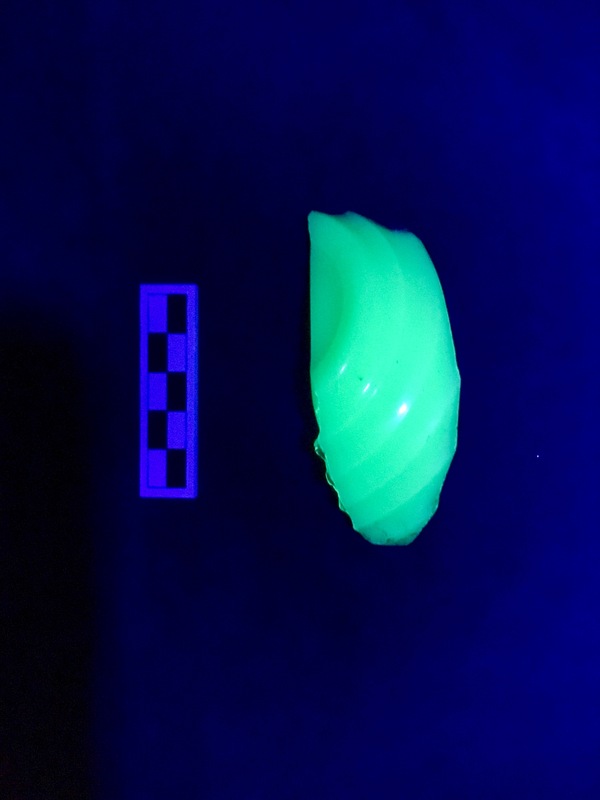 While the fragment we recovered unfortunately does not have a maker’s mark, there are many examples of ribbed jadeite products produced by Jeanette during this period. 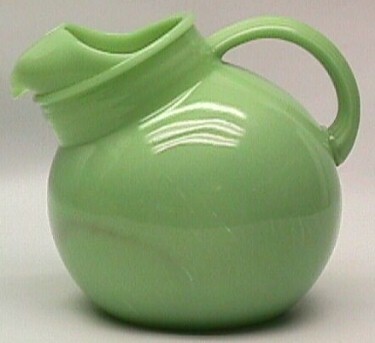 Fire-King ball jug – the holy grail of jadeite collectables. Image Source. Today, jadeite is highly sought after by collectors. While the more common pieces are fairly affordable, rare pieces like the coveted Fire-King Jade-ite ball pitcher or the handled soup cup can sell for hundreds of dollars (4,7). At the time it was produced, however, jadeite was not a high-end product (8). Jadeite wares were sold at five and dime stores and were often given away as promotional items. Citrus reamers were given away to customers for free with the purchase of boxes of fruit (5) and smaller jadeite items were included in bags of flours or boxes of oatmeal in hopes of enticing consumers to buy the complete set or larger, more expensive items such as dinner plates (8). Jadeite could be sold cheaply is because it was cheap to make. It was originally made with green scrap glass added into milk glass mixtures (8). Additionally, most jadeite items were made using presses, which allowed for mass production. Pressed glass is made by pouring molten glass into cast-iron molds either by hand or by automated machines (9). Pressed glass was particularly popular in the Depression era because this mode of production made it possible to produce a large quantity of items quickly and in a range of patterns and styles (10). These inexpensive pressed glass items carried many glass companies through the Depression (10,11). Despite its low cost, jadeite is very durable, which explains why it can still be readily found intact in antique and vintage stores (5). Jadeite has many enthusiastic fans, including Martha Stewart and her daughter Alexis (5). Martha’s jadeite collection was featured prominently in her cooking show, which helped drive up the popularity—and prices—of vintage jadeite in the 1990s (7). Avid collectors can be very particular about their jadeite. 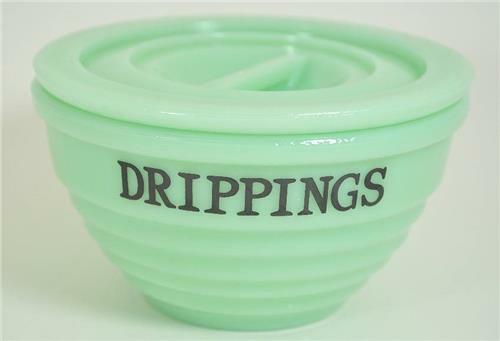 Purists consider only McKee, Jeannette, or Anchor Hocking products authentic jadeite (4). However, jadeite’s newfound popularity has inspired production of a variety of new pieces. Martha Stewart’s company, Martha by Mail, and Cracker Barrel make jadeite reproductions that are fairly close approximations of old pieces (4,7). You know… if you’re looking to start collecting. Sooo should i take my Burmese jadeite bead necklace off? You’re safe! Man-made glass Jadeite is safe to wear, and if your necklace is Burmese jadeite you’re even safer since it’s a naturally occurring gemstone. Great, now my wife won’t eat from our extensive collection of Anchor-Hocking jadeite. I can’t convince her that it is safe. Also, she’s confusing the green clear carnival glass with Jadeite. She wants me to sell a collection I’ve been collecting for 30 years. I wish you could explain that it won’t cause cancer.